A snowmobiling sign is seen in Newport. A man died in Long Pond after he crashed his snowmobile on Saturday afternoon. It was the first snowmobile fatality of 2019. 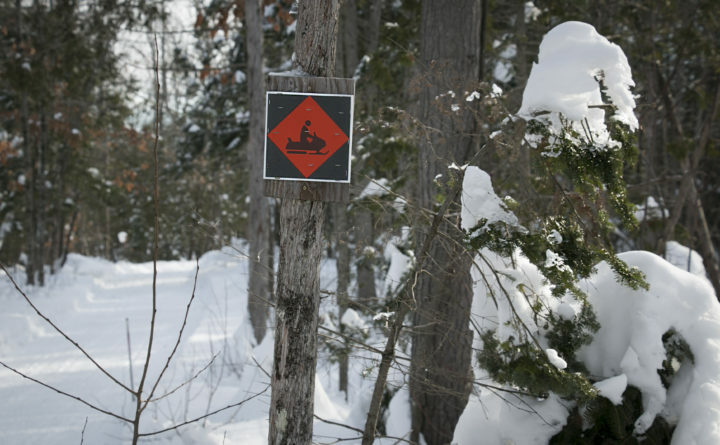 A Long Pond man died Saturday in Maine’s first snowmobile fatality of the season. Bryan Sylvester, 57, left for a snowmobile ride from his Long Pond Road home about 2 p.m., and after driving for about 1.5 miles onto Long Pond near Parlin Stream where game wardens say he struck a large snow drift and was ejected from his 2008 Ski Doo MXZ 600 snowmobile, according to Cpl. John MacDonald, spokesman for the Maine Warden Service. Game wardens responded to the scene and located Sylvester about 7:45 p.m., MacDonald said. Sylvester had been riding alone at the time of the crash, and he was not wearing a helmet, according to MacDonald. Sylvester’s body was taken to Giberson Funeral Home in Madison. MacDonald said that Sylvester worked for the Maine Department of Transportation. Game wardens continue to investigate Sylvester’s death. Jackman Fire and Ambulance assisted the Maine Warden Service.